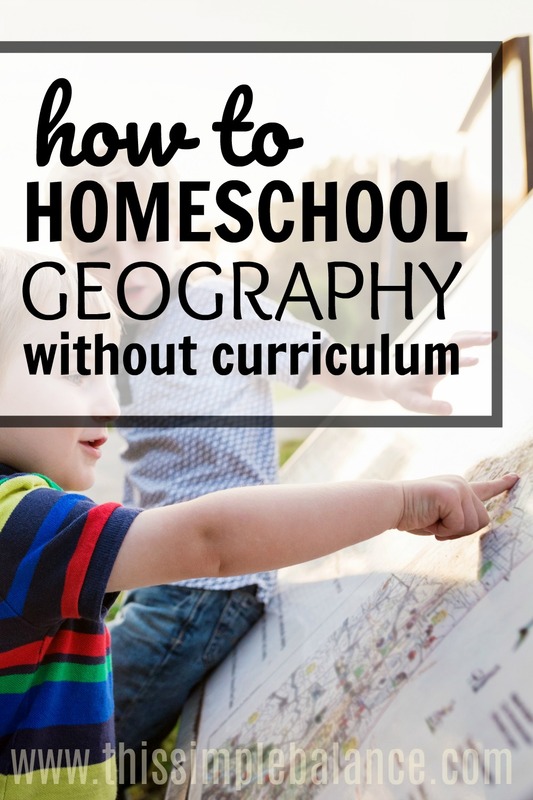 Inside: Incorporating geography in your homeschool doesn’t need to be difficult. 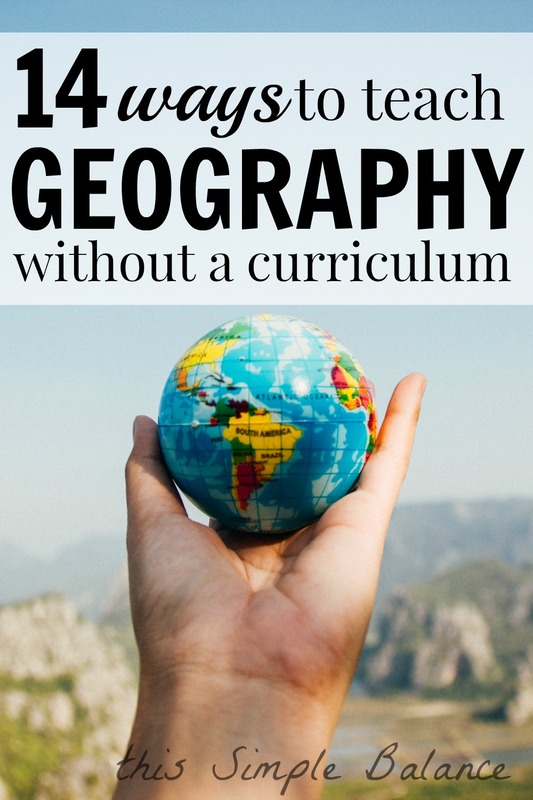 Get 14 ideas for how to naturally teach geography without a curriculum. Geography is one of those subjects that can easily get pushed to the back burner day after day, in public schools and homeschools alike. After putting so much effort into math, reading, writing, and maybe science and history, finding the energy to get to subjects like geography can be a real challenge for any teacher. Studies consistently show that U.S. Students are terrible at geography (source). But raising kids who have a good grasp of geography doesn’t have to be hard – promise! Any parent can use these ideas to raise globally minded kids, ensuring that they have an excellent grasp of geography, homeschooling or not. Incorporating geography into your everyday life when your kids are young makes it fun and natural. You can inspire your kids to be globally minded and talk about geography every single day using these tips. After using these ideas in our daily life, my older kids – ages 7, 5, and 3 – now have a better knowledge of geography than I do (yes, even the 3 year old)! But be warned: after applying these tips, your kids just might start regularly asking to travel all the over the world. Better start saving. My personal experience with geography was a sad one. Seventh grade geography was supposed to be “the year” to get all that geography knowledge I lacked. Unfortunately for me, we ended up with three different teachers over the course of the year because my class was so awful, they drove teachers away every few months. I learned next to nothing about geography that year, and thus, next to nothing about geography in my twelve years of traditional schooling. Don’t ask me for directions….anywhere. Thankfully, geography doesn’t have to be confined to just one year of twelve years of education. It’s not difficult to make geography a natural part of your kids’ lives if you know where to start. These simple ideas will have your kids pointing out Djibouti (that teeny tiny country above Ethiopia I can barely see) and asking to travel to Turkey in no time at all. No time to finish it now? Pin it! 1) Display maps in your home. Just like displaying a clock gets kids interested in learning how to tell time, displaying maps gets kids interested in learning geography. We have this one framed right above our kitchen table. By putting maps at the center of your most used living spaces, you communicate to your children that you value the world, and you want to talk about it. Just one works, but you can take this tip as far as you want to. There are dry-erase map wall decals, larger maps, and painted maps on canvas. Marla Taviano of an unschooling manifesto (my favorite homeschool read of all time) even has a map shower curtain! 2) Own, and regularly play with a globe. If you are wondering how to get beyond just knowing where things are on the map and move discussion to things like mountains, rivers, and other major landmarks, get a raised globe. We recently acquired this one that has a place of honor on our living room bookshelf. We bring it down to play with almost every day. The kids can feel the raised surfaces and notice the differences in landscapes. They immediately noticed the major mountain ranges of North America and how parts of the Midwest are flat and lack mountains. Globes are perfect for generating discussion about how oceans connect, the equator, how the world spins on an axis, and more. Like the globe, quality geographic puzzles adds a tactile component to geography. The more senses you can incorporate in you learning, the more facts will stick. I personally dislike crafts and hands-on activities, but I know my kids need them. Puzzles are the perfect compromise. We currently own a handmade wooden puzzle map of Africa and the wooden Melissa and Doug United States puzzle. My kids do the Melissa and Doug puzzle almost daily. They do it with the frame and without the frame. They trace the different states onto paper over and over again. We also have the world Melissa and Doug floor puzzle, but it can be frustrating as the pieces don’t connect and are easily moved out of place by a certain toddler. I am planning on adding to our puzzle collection soon with a map of Europe and a map of Asia. 4) iPad games and apps. Stack the States and Stack the Countries are a big hit around here. These apps are excellent educational tools for any child – traditional school or homeschool. They teach state and country shape recognition, placement and capitals. You can also eventually add major landmarks to the mix, too. It is enticing enough that even if you can’t read, you want to play it, but only kids with higher reading levels will be able to do it independently. If you have a range of ages, your older kids can play with the younger ones and read the questions aloud to them. Jamie Martin of Simple Homeschool published a book last year called Give Your Child the World. Like other reading treasuries, it provides a curated list of the best picture and chapter books for raising globally minded kids. 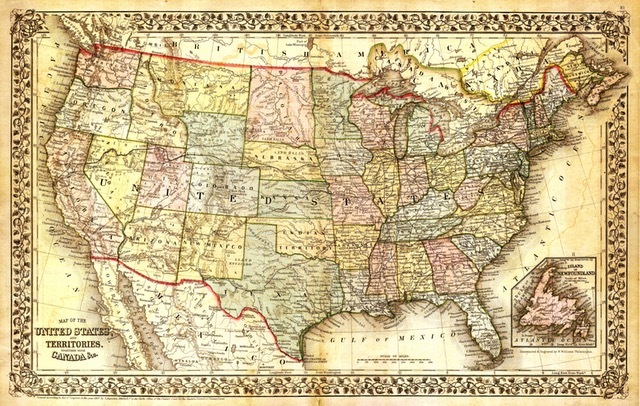 Whenever we read aloud, we point out places on maps, either on our world map or globe or on Wikipedia. It seems simple, but it takes time to make it a habit. Chantel Klassen of Intentional Homeschooling also provides excellent children’s book lists of all kinds. Picture Books Set in Paris is one example. You can access the rest of her book lists for specific countries in her new course Explore the World From Your Home, which I’ll talk about next. If you are a homebody, can’t afford to travel the world right now, or prefer not to with little kids (I’ve done it, and I don’t blame you), you are going to love Explore the World from Your Home. This course is an extremely affordable way for any parent to make geography part of your kids’ education. Chantel Klassen is a former teacher turned homeschooling mom who loves to travel and hopes to do more of it with her family in the future. In the meantime, she wanted to show her children the world from the comfort of home. 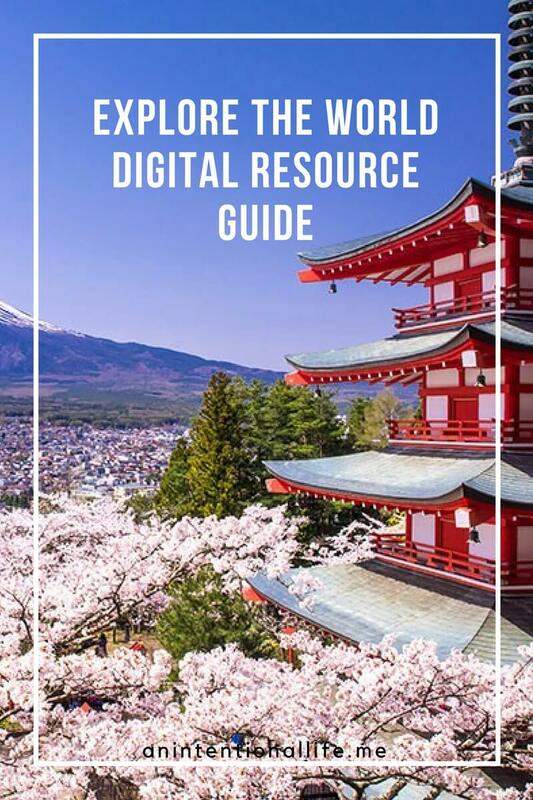 She sifted through Youtube, Google Earth, and other resources to find quality digital content for countries around the world. Explore the World From Your Home provides picture book lists, video tours of major landmarks, and even relevant drawing tutorials for each country, all in one organized, easy to navigate course. My kids jumped right into the course and especially love the drawing tutorials. Google Earth has been around for a while now. If you haven’t been on it recently, check out the recent updates – your kids will love seeing their favorite countries in real-time. One of my kids constantly asks about the people who live in various countries: “Mom, what do the people in Spain look like?” I can go to Google Earth, access street view and actually show him the people of Spain. How cool is that? National Geographic offers an excellent database of articles on how to teach your children about maps. Their mapmaker allows you to print maps of specific countries. You can select any of the landmarks you want to include. There is also the option to draw circles or arrows onto the maps, depending on what you want to teach. These maps are a great opportunity to hone in on bodies of water, mountain ranges, and other major cities beyond the capitals. You have the option to remove any of the features the map initially displays, so you can print a blank map to test your child’s knowledge or just for coloring and displaying in your home. This game was created by my three year-old (creator of math facts in reverse). Inspired by Stack the States and Stack the Countries, he uses car time to quiz me on capitals. Just like math facts in reverse, he quizzes me. “Mom, what is the capital of Singapore?” Thankfully, Siri comes to my rescue quite often, and we learn the capitals together. The answer is City-State, in case you were wondering. 10) Own an atlas and other large, colorful geographic books designed for children. Many local thrift stores have old atlases. By owning an atlas and taking it out on purpose to look at yourself, you continue to develop your children’s interest in the world from a new angle. Depending on the age of your kids, watching the news may not be an option. We do not have cable, so any news we get through news websites or Youtube. After reading Simplicity Parenting, I am careful to filter world events and the news for my kids. There is simply too much tragedy in the news today, and it can trigger anxiety in children, particularly highly-sensitive kids. That being said, I do let my kids know about major world events. We regularly discuss how privileged we are to live in the United States and what it is like to live in countries where food, water, and safety are not guaranteed, which brings me to my next point. Use your discretion, but the news is another great way to bring geography into your day to day. Opportunities to sponsor children in third world nations abound, both religious and secular. 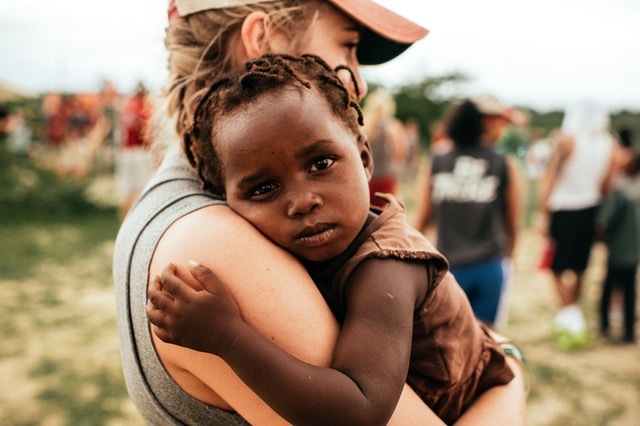 Sponsorship generally provides food, clean water, and education to children in need. Many programs also encourage sponsors to write letters back and forth – a great opportunity to practice writing and for your kids to ask all their questions about life in another country! An added bonus to making a tangible difference in the life of another child. 13) Pray for the nations. We support individual missionaries living in countries around the world, making it easy to focus on specific countries and people. I can easily say, “Let’s pray for so and so and their kids living in North Africa.” We point to the map and figure out how far they live from us. If you need more guidance on how to pray for different countries, you can find detailed prayer points in books like Operation World. They provide religious history and background, which can also spark discussion on world religions. Another book that has sparked conversation about world geography is Missionary Stories with the Millers. We started this book in the beginning of the school year when we were still doing Sonlight Core B. Obviously, actually traveling the world is a great way to teach geography! My go-to person for information on how to travel with kids is Tsh Oxenreider of The Art of Simple. She traveled the world with her children for an entire year – homeschooling, working, and traveling with little kids. Her revamped podcast The Simple Show dedicates one out of every three shows to travel with co-host Stephanie Langford who also traveled the world with her kids. You can find some great tips for traveling with young children in the archives (Episodes 34-37 is a four part series on the subject). If you want to hear how one family homeschooler while traveling, Tsh recently published a book At Home in the World: Reflections on Belonging While Wandering the Globe that is a memoir of her trip around the world. 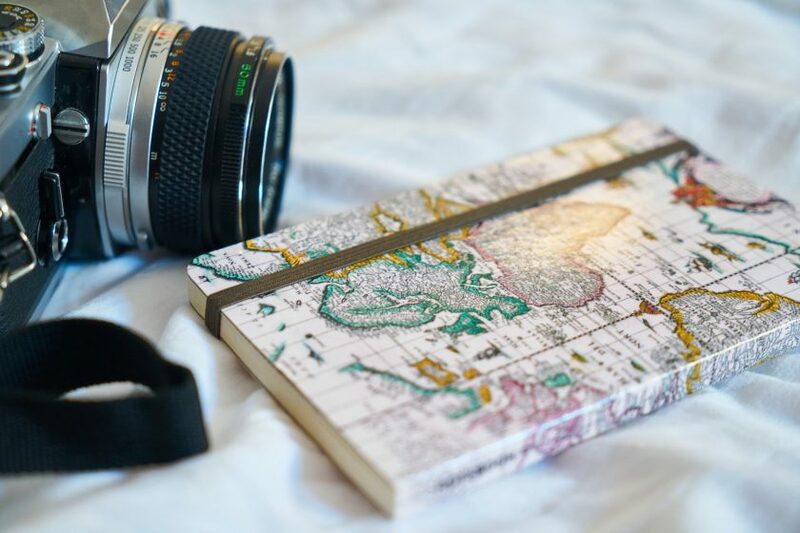 If travel is not an option, another way to bring the world to you is through Little Passports. 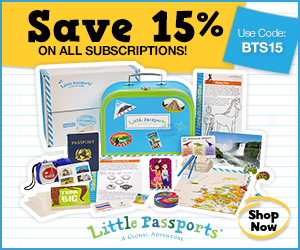 This unique program allows your child to “visit” a different country each month. My kids are loving their Little Passports boxes every month. It’s such a fun way to teach geography! I have personally found geography the easiest subject to work into our everyday life. Between games, puzzles, and big, juicy conversations (Brave Writer reference), we homebodies love the world! We are doing our best to raise children who are globally-minded and who care about the world beyond America. I hope you are able to work geography into your days as easily as we do! Subscribe to get my regular e-mails! Get 12 reverse planner pages with inspirational quotes (complete with one M-W page) as a free welcome gift. Success! Now check your email to confirm your subscription and get your free planner pages. We love to watch movies/ documentaries, play board games, and put together puzzles. We also enjoy cooking new foods from lands we’re studying. I think geography is one subject that we can really have fun with. Thanks for sharing Kirstee! We love geography around here – trying to justify that canvas map set I referenced as part of the homeschool (not decorating) budget. 😉 I hope these ideas help your family love geography as much as we do.